I know I know....Valentines Day is not for like a month and a half away...BUT one of my new years goals was to get organized and not procrastinate, so here is a little early inspiration. Bottom line is you either love Valentine's Day or you don't. I love it and I love partaking in all the hallmarky-ness about it. I still remember being in grade school and trying to find the perfect Valentines that I would pass out to all my friends and hoping mayyybe that boy would send me one of those little candy telegram things....never happened ha! 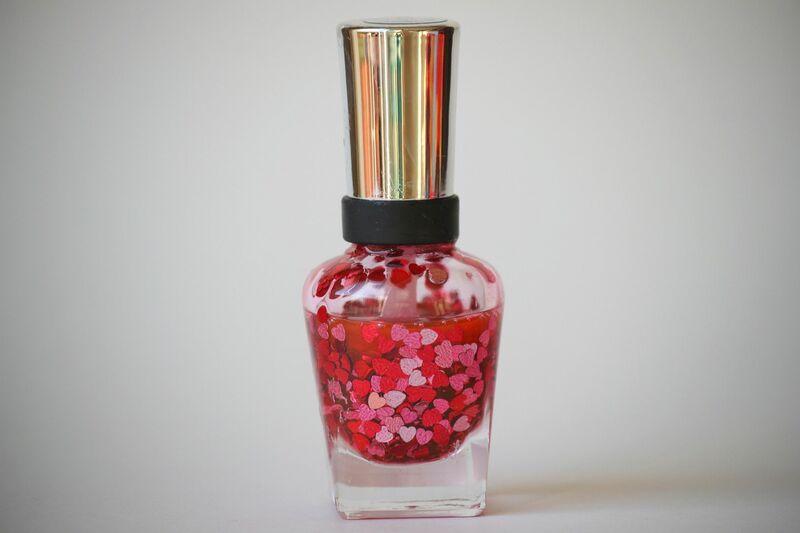 Empty out half the bottle of clear nail polish to make room for the heart glitter. 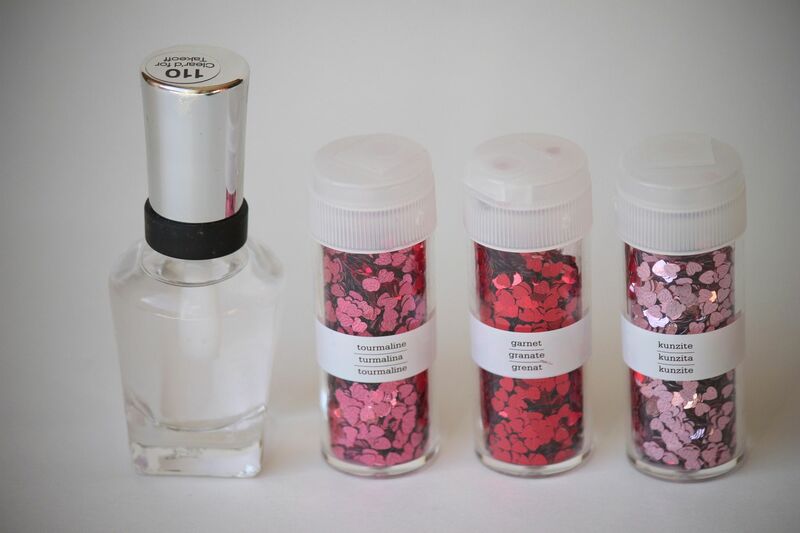 Add a TON of heart glitter into the bottle. Shake it up and you're done! So easy. 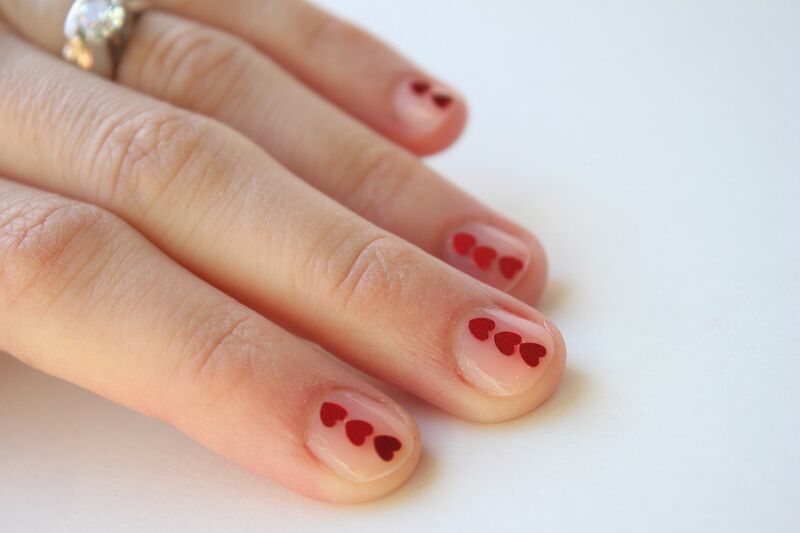 If you like a more uniformed look, paint a coat of clear nail polish, apply three hearts to each nail (two on pinky) and then top with one more coat of clear polish. What a cute idea! I might even paint my nails pink and do the red hearts over it! cuute! i love this!! and it's super simple, too! LOVE LOVE LOVE this!!! Thanks so much for sharing. So cute! I love adding glitter to my nails! fab idea...my daughter would go nuts for this!! Gorgeous! My little girls would love this for the holiday. I've got to do it, thanks for the fun idea! Those are very cute nails! Sorry to be picky but it's "Stewart"
Oh my gosh, I can't wait to do this with my daughter. Thanks Lindsay! Cute! I love Valentine's Day too! I think it is a great reminder to show your love! This is such a great idea, I love it! What a neat idea :) love this! That's so creative! Definitely going to keep that in mind for V Day! Very cute! My girls would love this. Do the hearts stay on good? Oooohhh this is such a fun idea...love it! eep, cute!! 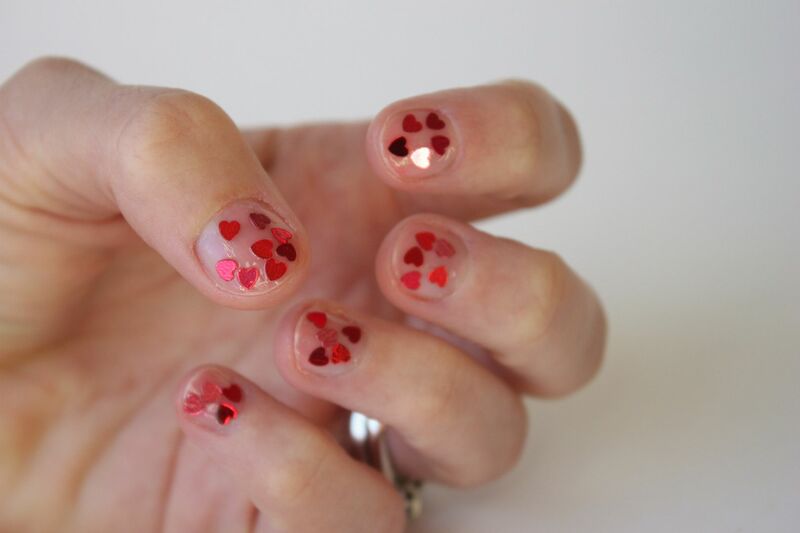 such a simple and wonderful idea, thanks for sharing :) and I loove the little heart glitter! happy new year and hope you are feeling great ..
Flipping GENIUS! I love it and am going to absolutely do this! this is so so cute! valentines day to me is meh can do with or without, it is much better with a husband now, but i think i love your heart glitter nail polish much more than i will ever love valentines day. Cute, cute Lindsay! Fun idea. LOVE this! i work with kids and never last a day before my nail polish chips...with the clear coat you wouldn't even notice :) thank you thank you! i love the three hearts in a line! sooo cute! so cute! You are so creative as always! I like this idea. Thanks for sharing and happy new year! So cute!! Love this idea!! Clear nail polish is great for all sorts of custom things. You can paint your nails with acrylic paint you get at a craft store, then coat it in clear polish and you have fancy new nails! Clever girl. I love the hearts in a row! love this for valentines. can't wait!!! oh my gosh, how cute!!!!! That is so cute! I can't wait for Valentine's to come around so I can try this out! Wow, such a fun idea! I don't even want to wait for valentine's day to try this. Thanks for sharing! Wow, adorable! My daughters would love it! Thanks for stopping by my blog. I love yours. I am your newest follower! You are so beautiful! oh my gosh, love this! This is such a clever idea! And it looks fabulous! Thanks for sharing! Love it! That is too cute, I am going to have to try this! Love the 2nd look. Does the Martha glitter 'melt' in the polish after a bit? She makes the prettiest glitters but Im worried about all the colors coming off and getting icky like some do. Such a cute idea! I love the three hearts in a row! I found this on Pinterest and came right over....SOOO doing this, LOVE it!!! What do you do with the other half of the bottle of polish? I would hate to just put it in the garbage.